Talk about missing a trick. Ignoring St George’s day, the Conservatives chose Friday to release their “English manifesto”. Not wanting, I imagine, to identify themselves even more as the party of England, the Tories left St George’s Day with UKIP, who made hay with it. Nigel Farage was pictured in a St George costume, and they even came up with a decent line on whether St George, a Turk, would have been allowed into the UK based upon UKIP immigration rules. Patrick O’Flynn pointing out that St George would be welcome as a highly skilled migrant, as long as we didn’t have enough dragon slayers in our own population. Back to the Tories though. 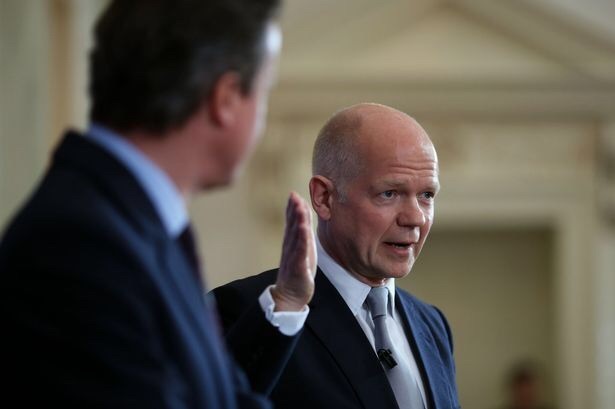 David Cameron made a speech in Lincoln, side by side with William Hague, the outgoing MP and former a Foreign Seceetary who has been in charge of creating proposals to give devolution to the one UK nation not yet to benefit from power decentralisation. Unlike UKIP, Cameron isn’t able to promise a fairer public spending settlement compared to Scotland, as he vowed to protect the Barnett formula during his panicked response to the advance of the “Yes” campaign in the Scottish Referendum. What he can do, however, is to ensure Scottish MPs can’t impose higher taxes on England without be willing to bear those taxes in Scotland. Hague explained that “no bill or pat of a bill relating only to England would be able to pass to its third reading and become law without being approved in a grand committee made up of all English MPs, or English and Welsh MPs.” This means that a bill relating only to Englanf only cannot be passed without the consent of English only MPs. In other words, a majority of English MPs cannot be outvoted on English only matters by a majority of all MPs. Cameron and Hague then made sure a charge of English Nationalism wouldn’t stick by pointing out that a Scotland Bill, more devolution for Wales and reforms to help Northern Ireland will be introduced alongside this “English votes for English Laws” Bill. However, this hasn’t really gone far enough in some peoples’ eyes. There is no way for MPs representing English seats to initiate legislation for England, which means England is the only ever country out of Northern Ireland, Wales and Scotland not to be able to vote for their own policy agendas. Furthermore, the proposals talked about on Friday may not survive coalition negotiations. The Liberal Democrats are not keen on giving England, which leans so much towards the Tories, the power enjoyed by other parts of the UK. Labour, meanwhile, have nothing to say on this issue. That said, it speaks volumes that instead of announcing this on a Monday, which is what happens during election campaigns if a party wants to signal it is an important issue for them, the Conservatives made their major speech on the issue on a Friday. So perhaps they realise this isn’t a vote winner, but just something they want a mandate for should they, somehow, win a majority on May 7th. That is unlikely, and so, to be honest, is English votes for English laws in the near future.